The ARM Cortex-A8 is a 32-bit processor core licensed by ARM Holdings implementing the ARMv7-A architecture. Compared to the ARM11, the Cortex-A8 is a dual-issue superscalar design, achieving roughly twice the instructions per cycle. The Cortex-A8 was the first Cortex design to be adopted on a large scale in consumer devices. "ARM Cortex: The force that drives mobile devices"
^ Gupta, Rahul (April 26, 2013). "ARM Cortex: The force that drives mobile devices". The Mobile Indian. Retrieved 2013-05-15. ^ "i.MX51 Applications Processor and Linux Hands on" (PDF). Archived from the original (PDF) on 2011-11-19. Retrieved 2011-10-20. ^ "RK29XX". Archived from the original on 2011-11-05. 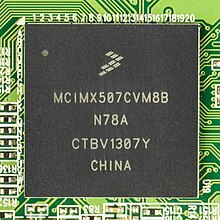 ^ "CX97255" (PDF). Archived from the original (PDF) on 2012-11-19.